“The interface to the smart home is not your phone – it’s your voice, it’s the TV, it’s your wearable device. Speaking to devices is natural.” Dizmo’s user interface (UI) supports any input method – simultaneously, if so desired – the legacy mouse and trackpad, touch control as well as gesture and voice – it needs to be future proof and ready-made for interfacing with your smart environment in a completely intuitive way. We totally agree with Steffen – your smart home should be controllable from your phone, your TV, your wearable, your voice. In dizmo, we envision a scenario that enables users to orchestrate their devices and services from any single endpoint. Where you enter and where you leave the broader ecosystem will cease to matter – it’s really about what and how much it can simply do for you that will define the relevance of the term “Everywhere Internet”. To do this you need a Ubiquitous UI solution accessible from each and any of your endpoints – such that the whole home is monitored and managed from this UI/UX framework. This is dizmo. “Connecting devices is not enough; that’s why services such as IFTTT and machine learning are fundamentally important to moving the word ‘smart’ beyond just a marketing term.” With dizmo, “external-to-the-home”-scenarios blend and work with your intelligent home devices for Smarter Living. Bad weather and morning traffic? Your smart home wakes you up 30 minutes earlier today so you are not late going to the airport. Ever dreamed about real-time extracting the recipe from your favourite TV cooking show? The cooking dizmo does exactly that, then the same dizmo tells you how to cook and sets timers. Dizmo enables consumer-build, even for home owners with lower IT literacy; and dragging two dizmos together is easier than building IFTTT rules. Such agnostic “glue” functionality solves interoperability of cross-protocol devices and cross-protocol ecosystems at the interface level. 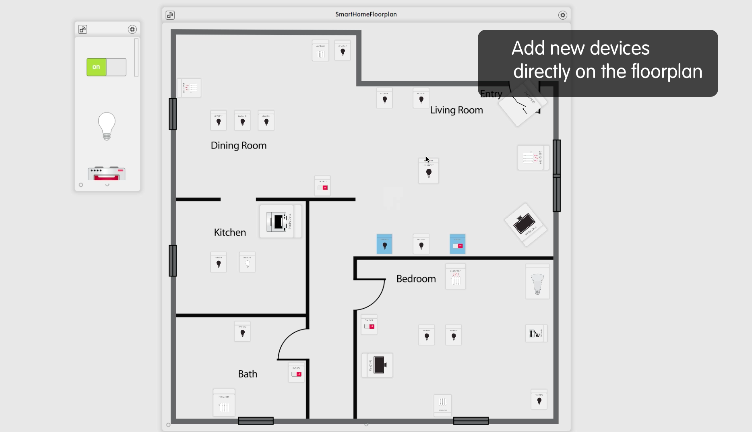 The Smart Home control panel is your visual floor plan – no need for more of those smart home modular menu lists. With dizmo you can sketch and scan, take photos, drag and drop them. Avoid modular lists that we often see with standard room-builder experience interfaces, and achieve greater smart home UX and customer engagement. We at dizmo are convinced: it needs to be totally intuitive!